As we embark upon our journey, we are gradually pulling away from our everyday life. In a strange environment, everything we see seems to blink in the dazzling light. This sort of excitement and anticipation is the most attractive part of travel. However, travel and everyday life are not two opposite ends of existence. Living in a strange place is a constant integration process across the border between travel and everyday life. 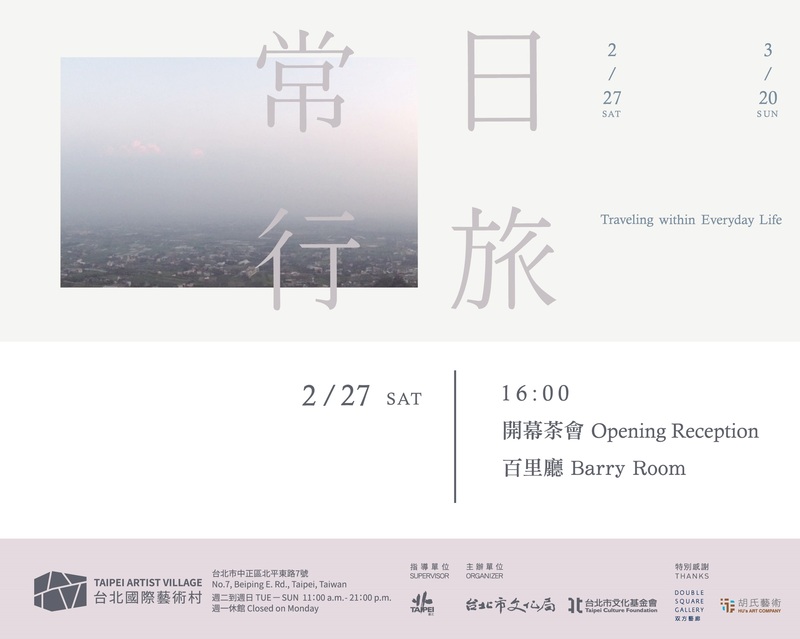 The artists visiting Taipei Artist Village in January, 2016, in my eyes, are all travellers in different journey stages for different purposes. Among which, someone is travelling around Asia; Taipei represents one chapter of the story about Asian culture. Someone has conducted some observation and fieldwork for some time in different parts of Taiwan, creating the work with a mixture of deep insights into this island. Someone is a nomadic artist who considers the world as home and starts to explore the city’s landscapes and soundscapes in obscure corners. Someone is carrying out the first trip for two with a baby in her belly. Those fragments of her life experience in Taipei are filled with expectation for future. Someone has found himself/herself at home in Taipei and is currently seeking for a new path in this familiar city. These artists’ works on display reflect their own understanding and perspectives growing out of the experience under the interaction of travel and everyday life. They review both inside and outside of physical and mental space and the status that the borderline is constantly redrawn. As Marcel Proust put it, “the real voyage of discovery consists not in seeking new landscapes, but in having new eyes.” When you are on the road, no matter how magnificent and rare the stunning view is, or how ordinary and dull the daily life landscape is, both can be equally splendid and beautiful. Let’s see the world with the traveller’s eyes and live everyday life with the attitude to travel. When travel becomes everyday life and everyday life becomes a journey, let’s depart from here at this moment!